For news and updates related to my recently published book, Track Changes: A Literary History of Word Processing, please see my Tumblr site. I recently gave the 2016 Rosenbach Lectures in Bibliography at the University of Pennsylvania, under the collective title of Bitstreams: The Future of Digital Literary Heritage. All three nights are now available for viewing. The book version of the lectures is under contract to the University of Pennsylvania Press. 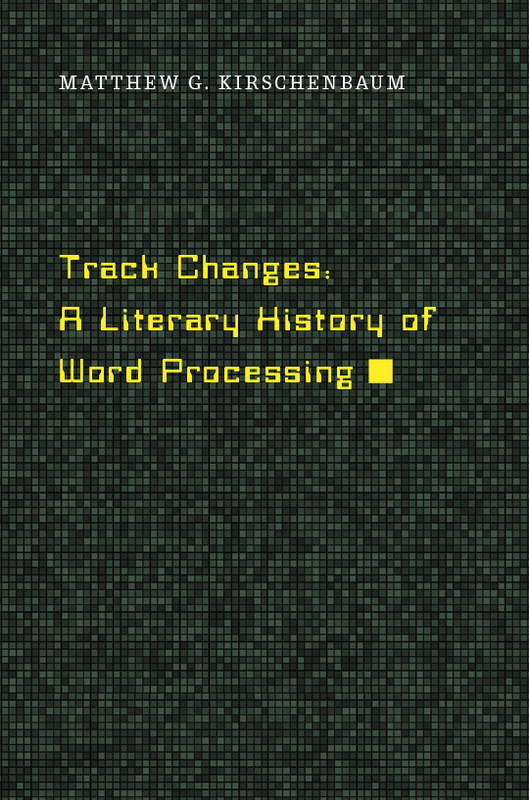 Very excited for two new books coming out this spring: Track Changes: A Literary History of Word Processing, due out from Harvard/Belknap in early May 2016 (approx. 340 pages with over 20 photographs), and Zones of Control: Perspectives on Wargaming, an 800-page (!) anthology with almost 70 contributors and over 100 illustrations co-edited with the incomparable Pat Harrigan, due out from the MIT Press in late April (and part of the exciting new Game Histories series at the Press). Both are currently available for pre-order. Available here is the full text of an essay published in differences 25.1 (2014) as part of a special issue entitled In the Shadows of the Digital Humanities edited by Ellen Rooney and Elizabeth Weed. Duke UP’s publishing agreements allow authors to post the final version of their own work, but not using the publisher’s PDF. The essay as you see it here is thus a PDF that I created and formatted myself from the copy edited file I received from the press; subscribers, of course, can also read it in the press’s published form direct from the Duke UP site. Other than accidentals of formatting and pagination this text should not differ from the published one in any way. If there are discrepancies they are likely the result of final copy edits just before printing—I’d appreciate having them pointed out. These and other comments can be entered below or sent to me via email. This essay is copyright (c) 2014 Duke University Press. Accepting that the “Digital Humanities” under discussion is a discursive construct rather than “actually existing projects” (a clarifying phrase I lift from Rita Raley), my argument here suggests that this construct is too often indulged at the expense of in situ critique of actual projects, as well as papers, publications, syllabi, and so forth. We inhabit the construct when we forgo these normative products of academic labor in favor of the terrible things of my title, things that are said near-daily on blogs, lists, and Twitter: Digital humanities is a nest of big data ideologues. Like Johnny, digital humanities won’t read. Digital humanities doesn’t do theory. Digital humanities never historicizes. Digital humanities doesn’t do race, class, gender, or, for that matter, culture. Digital humanities is complicit. Digital humanities is a neo-liberalist contrivance for dismantling the professoriate. Digital humanities is the academic import of Silicon Valley solutionism. Perhaps most damning of all: digital humanities is something separate from the rest of the humanities, and—this is the real secret—digital humanities wants it that way. Yet the zero-sum agon of the construct seems itself complicit in a world view that is neo-liberal, ahistorical, and unconcerned with the materialities of contemporary scholarly production. Sometimes, and not incidentally, the construct can even resemble the virtualized Kung Fu arena of the Matrix that was called by the same name. This essay, the third of what has become an unplanned trilogy, explains why. Those who follow my work will know that I’ve been focused for a while on issues around the preservation and scholarly investigation of a variety of different kinds of born-digital materials, from electronic manuscripts to video games and virtual worlds. I’ve tried to be a bridge between the professional practitioners in the archives community and conversations ranging from digital forensics to media archaeology and textual scholarship. Recently, I’ve found myself engaged specifically with the problem of software as a class of born-digital materials: executable content. There’s been a rise in the level of community engagement around this topic, and some even more exciting developments are in the works. Here, however, I’ve grouped my contributions to this emerging discussion. Last May, the Library of Congress sponsored a two-day meeting called Preserving.exe, dedicated to jumpstarting a national strategy around executable content. I reported on the meeting for Slate magazine in a piece called “History.exe“; my editor then asked me if I would be willing to put myself out there with my own “Top 10” pieces of software I thought deserved long-term preservation, which I did: “The 10 Most Influential Software Programs of All Time.” The comments are the best part (really: my list was merely a pretense and catalyst for discussion, and, as expected, there are some awfully good suggestions in there). The official report from the Preserving.exe meeting is now out (PDF), and contains essays by Henry Lowood, Alice Allen, Peter Tueben, and myself. My piece, entitled “An Executable Past: The Case for a National Software Registry” (pages 12-22) offers a rationale for such an effort modeled (albeit with some crucial distinctions) on the well-publicized activities of the National Film Registry. Back in September, Rhizome hosted a panel discussion at the New Museum on “Born-Digital Conservation in the Computer Age” featuring myself, Lori Emerson, and pioneering video and computer graphics artist Lilian Schwartz. We had a wide-ranging discussion, ably steered by Ben Fino-Radin (video of the event was recorded but is not currently available). Meanwhile, text of my remarks at the Library of Congress’s Electronic Literature Showcase last April is just downstream here: “Confessions of an Incunk.” In them I focus on electronic literature as software and executable content. Finally, a long essay entitled “The .txtual Condition: Digital Humanities, Born-Digital Archives, and the Future Literary” is now out in Digital Humanities Quarterly. Among other things, the piece offers an intervention in the OAIS reference model by way of Wolfgang Ernst and media archaeology. This is the text of a talk I gave on April 5, 2013 on the plenary panel at the Electronic Literature Showcase at the Library of Congress, curated by Kathi Inman Berens and Dene Grigar. I come before you today, unapologetically, as an Incunk, that is one who has assumed archival and curatorial stewardship over the two electronic literature collections at my university (both, happily, from writers who are still among us, one of whom is even amongst us in this room today). In my remarks I want to candidly consider some of what is at stake in these transitions and transactions, as electronic literature passes from outsider practice to cultural heritage as sanctioned by its passage from private hands to an increasing number of major collecting institutions. All of this is a relatively recent phenomenon. The Harry Ransom Center at the University of Texas at Austin, known for its collections in innovative 20th century writing, led the way by acquiring Michael Joyce’s papers in 2005. Joyce, of course, is often credited with writing the first extended work of hypertext fiction, 1987’s Afternoon: A Story, published by Eastgate Systems. 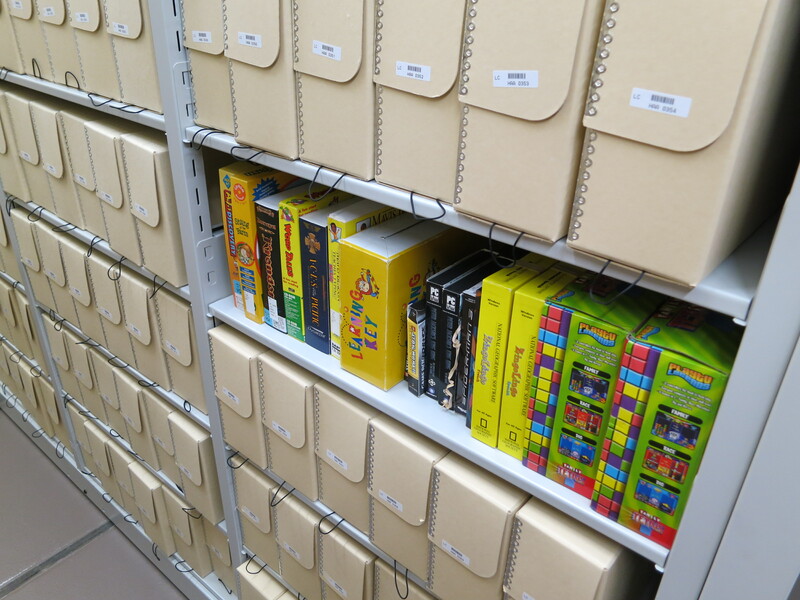 The accession included some 60 manuscript boxes, as well as 371 floppy disks and three hard drives. Like all of the collections I will discuss today, the Michael Joyce papers are thus a hybrid archive, neither exclusively digital nor analog. As the first researcher to work with those materials, I found myself continually moving back and forth between page and screen, between manuscript materials of the sort cherished by any visitor to rare books reading rooms—including a precious sheet of handwritten notes and code fragments for Afternoon, complete with coffee cup stain—and the Ransom Center’s computer workstation, which I used to access the digital files that had been painstakingly migrated from those original floppies and hard drives. In 2007, the Maryland Institute for Technology in the Humanities (MITH) at the University of Maryland where I work was gifted with a substantial collection of computer hardware, storage media, hard-copy manuscripts, and other collectible material from the author, editor, and educator Deena Larsen. MITH is not an archives in any formal institutional sense: rather, it is a working digital humanities center, with a focus on research, technical innovation, and supporting new modes of teaching, scholarship and public engagement. While this posed obvious challenges for our stewardship of the Larsen Collection, we also saw some unique opportunities; in late 2011, Bill Bly, also an Eastgate author, agreed to gift his own considerable collection of electronic literature and author’s papers to MITH, where it now joins Deena’s materials. Duke University’s Rubenstein Library, meanwhile, has also begun collecting the Eastgate writers. A 2009 accession from e-poet Stephanie Strickland garnered some 5500 hundred items occupying over a dozen linear feet, including “journals and anthologies featuring Strickland’s poetry; TechnoPoetry Festival materials; schoolwork, college, and graduate papers; posters and programs from events; proofs and drafts of her writings; and audio recordings.” The materials also include a CD-ROM containing data. [i] A year later Duke acquired an even larger collection from Judy Malloy, yet another key figure in the electronic writing community, including drafts and documentation for works such as Uncle Roger and its name was Penelope, as well as journals, exhibition files, correspondence, and research notes for her non-fiction. This collection also contains a number of diskettes. [ii] Stanford University Libraries, meanwhile, acquired the papers of Infocom co-founded and interactive fiction pioneer Steve Meretzky in 2009. At 42 linear feet, it includes “design and game development documents, correspondence, paper files, electronic games, magazines, data disks, original game package artwork, PR and marketing materials, and miscellaneous electronic game industry memorabilia.”[iii] And the Bodleian Library at Oxford recently received materials related to the production and publication of William Gibson’s famous disappearing poem Agrippa from publisher Kevin Begos. Yet what does it mean for an entity such as the Bodleian or the Harry Ransom Center to collect electronic literature? Should electronic literature be archived or should it be showcased? Should it be exhibited or should it be preserved? Should the data be migrated from one system to another, a step ahead of bit rot and the inevitable platform obsolescence, or should the original systems and machines be lovingly maintained, a curator pausing to squeeze a drop of oil into the old disk drive mechanisms from time to time while stockpiling spare boards, parts, and circuits from eBay? It’s tempting to take these rhetorical questions as invitations to indulge our instinct for indeterminacy, and celebrate the ways in which electronic literature continues to pose challenges, push boundaries, and confound the establishment. The reality, however, is that more and more libraries and archives are developing procedures and workflows for accommodating digital content regardless of whether or not they are actively engaged in the specific project of collecting electronic literature. It is difficult to imagine any public figure—author, artist, scientist, politician, or celebrity—with an active career from the 1980s forward whose personal “papers” do not include some form of computer storage media, or perhaps even entire computers. The most famous example to date is likely Salman Rushdie, who, despite having better motivations than many of us for safeguarding his privacy, has nonetheless transferred four of his old computers to Emory University’s Manuscripts, Archives, and Rare Books Library, where the hard drives have been forensically indexed, processed, and redacted, with selected content made available to researchers on a dedicated workstation in the reading room that supports a complete virtual emulation of the original operating environment, Macintosh System 7. This extreme amount of curatorial attention is clearly warranted both by Rushdie’s preeminence and the potential sensitivity of the contents of those hard drives, several of which date from the fatwa period; nonetheless, archivists are developing efficient workflows for processing digital materials at much larger scales, and such procedures and techniques are now a routine part of professional training in the archives profession. Many of the digital materials in collections I have been describing—notably word processing files and email correspondence—thus fit comfortably with the parameters of what is increasingly normalized professional practice. Of course much of the most significant born-digital material related to electronic literature moves beyond data files and email; it is, in fact, properly speaking, software, that is to say executable programs dependent on an operating system and complete computing environment. Hypercard, Z-Machine, Storyspace, TADS, Macromedia Director, Java, Flash, Twine, and Processing are all obvious examples. Here best practices are less certain, but institutions are actively aware of the challenge, as the Library of Congress’s upcoming Preserving.exe meeting, to be held next month, amply demonstrates. Moreover, there is significant grassroots activity in the area of software preservation, most notably in the retro gaming community, where fans, hobbyists, and enthusiasts routinely build and maintain emulators and interpreters to keep obsolescent platforms alive. Emulation alone is not a panacea and introduces its own risks and challenges, not least of them being the ongoing upkeep and migration of the emulators themselves. Emulation also always entails mediation—more so than most people realize, with everything from sound effects to processor speeds potentially a variable. Notably the Smithsonian’s recent Art of Video Games exhibition chose to forego emulation and run the various games it was featuring from as much of the original hardware as possible with concessions only to large-format display screens. Yet more than a decade ago, in a prescient essay entitled “The Hard Work of Software History,” Stanford University Libraries curator Henry Lowood made the point that the technical challenges involved in software preservation would likely ultimately be subordinate to the tribal differences manifest in competing practices and priorities among libraries, archives, and museums, all of which have claim to the work of preserving software. He writes: “[W]hile the relationship of software to hardware, its storage on physical media, or its association with artifacts such as disks, computers, and boxes, might lead one to think of software as fit for the museum, requirements of scholarly access such as identifying and locating sources, standards of indexing and meta-data creation, and maintenance of collections for retrieval and interpretation seem more in line with the capabilities and programs of libraries and archival repositories” (160). The material or artifactual dimension of electronic literature— and we experience this so vividly with Deena Larsen’s myriad craft-based writing practices—adds yet another layer of curatorial considerations. Electronic literature thus sits comfortably neither in the rare books reading room nor in the computer history museum. But while electronic literature thus poses significant curatorial challenges when it takes the form of executable software, it is less clear to me that those challenges are in any way unique vis-à-vis how other communities of interest, such as gamers, are also contending with the problem. We can take satisfaction in the knowledge that the papers and records of authors such as Joyce, Larsen, Bly, Malloy, and Strickland, as well as Gibson and Meretzky, now reside safe in the alabaster chambers of some of the world’s preeminent cultural heritage institutions. Yet this development also entails trade-offs and compromises. All of these institutions would have obtained a signed document known as a deed of gift serving to legally transfer ownership of the collection materials from the donor to the archive. While the particulars of deeds of gift of course vary, it is commonplace to include a clause dedicated to the de-accession of collection materials. This empowers the institution to discard that which it deems to lie outside the scope of its collecting strategy. In such cases control over collective memory has been legally ceded. Moreover, while the Ransom Center, Duke, and the University of Maryland all afford varying degrees of access to the electronic literature materials in question, the level of access varies and in all cases is more restrictive than would be the case were the material still to be in the hands of its original creators. First, of course, one must physically travel to the institutions in question. While some born-digital materials can be made available through the Web, the norm is for them to be provided on dedicated computers in the reading room, often with network and peripheral ports disabled—to prevent a patron from copying the contents of a collection to a USB stick, for example. Thus to examine one of Michael Joyce’s digital drafts I still must make the pilgrimage to Austin, just as if I wanted to examine the hard copy manuscripts of that “other” Joyce, who is also collected by the Ransom Center. Policies will also vary as to the amount of assistance available in accessing legacy electronic formats. Sometimes a digital file might be presented as what’s known colloquially as a BLOB, a Binary Large Object. No effort will have been made to migrate the content to a contemporary format. While such objects can be inspected using utilities like hex viewers, they will not perform as executable programs. Likewise, some institutions may provide a complete bitstream image of an original diskette which allows for mounting and emulating the original media, as well as various forms of forensic analysis, while others may offer access only to individual files. At present MITH at the University of Maryland is the only one of these institutions that would allow a researcher to actually insert an original diskette into a vintage computer and access content by flipping the power switch. Finally, typically a collection will not be available until after it is processed, meaning finding aids have been prepared and all of the material cataloged and described according to the institution’s internal standards. Collections processing requires staffing, and in this age of increasingly scarce resources more and more collections are lying in unprocessed limbo, accessioned by an institution that lacks the resources to process them for public access. I am happy to report, however, that with the exception of the Meretzky papers at Stanford all of the electronic literature collections I have been discussing have been processed and are open to patron use. Even so, there is no guarantee that a writers fonds will all be collected at the same institution; both Larsen and Malloy, for example, have also gifted materials to the University of Colorado’s Media Archaeology Lab, meaning future scholars must needs visit more than one locale. I began with Stephen King. But what’s really at stake in all this is what another novelist, A. S. Byatt, once summarized in the title of her brilliant novel of literary remembrance and collecting as possession. The term cultural heritage is a polite one that masks all manner of impolite and impolitic but inescapably political questions, not least of which are: Whose culture? And whose heritage? And above all, who gets to keep it, to have it, literally to hold it, to possess it in their hands? These are impassioned issues, and tensions around them, even among friends, will sometimes run high. Byatt’s possession, after all, is also finally about obsession, the word we give to the haunting, sometimes seemingly otherworldly negotiation of memory, desire, and experience. This Incunk believes we can negotiate the balance between preservation and access, between exhibition and safekeeping, between the showcase and the vaults. This negotiation is without a doubt “emergent,” to use Kathi Berens’s word from her curator’s statement for this week’s Showcase; but it is also a negotiation that is emerging within the context of a much wider conversation in the archives and cultural heritage community, for instance under the auspices of the Library of Congress’s National Digital Stewardship Alliance where practitioners from a wide array of different domains and subject areas collectively look toward the future of our oh-so-recent digital past. Electronic literature, outsider practice thought it still may be, has more in common with these other spaces and domains than it has apart from them. I wrote this short piece for Slate about my pick for the first novel written with a word processor—a teaser from Track Changes.